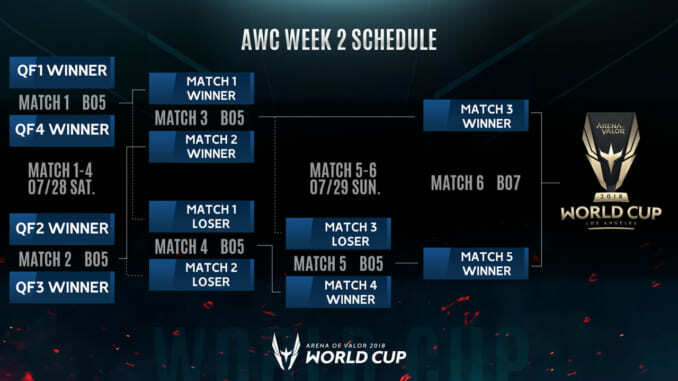 The Arena of Valor World Cup (AWC) Boot Camp held in Bangkok, Thailand has concluded, the final group seedings for the Arena of Valor World Cup now decided as a result. AWC kicks off on July 2018 in Los Angeles, USA. Update (03/07/2018): Due to recent circumstances, Tamago (Malaysia) will replace Clutch Guild (Philippines) as the representative team for MSP at the Arena of Valor World Cup in Los Angeles, USA. 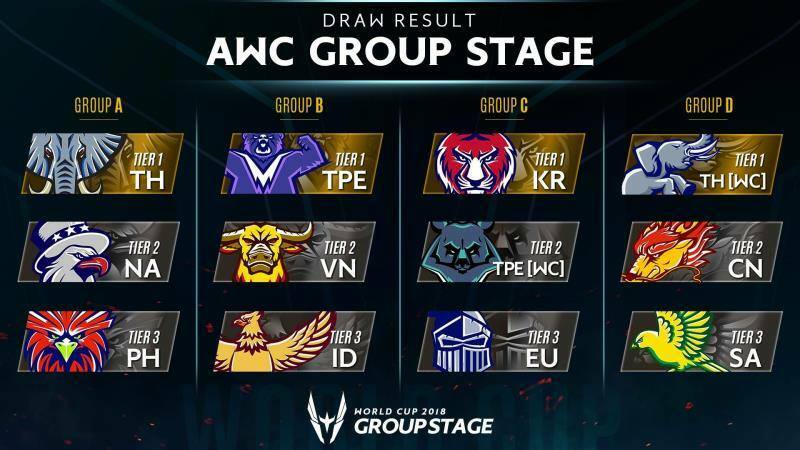 Twelve teams from around the world are set to hit the biggest competitive stage in Arena of Valor now that the Arena of Valor World Cup (AWC) Boot Camp held in Bangkok, Thailand has concluded. The grueling two-week boot camp determined the final group seedings with Thailand’s national team securing the top spot after a dominating 3-0 performance in a Best-of-5 (Bo5) match against the Taiwan team. Some notable matchups include the semifinals and finals stages (June 23 to 24) where the Taiwan national and wild card teams battled it out. The Taiwan national team defeated their wild-card counterparts 2-0 in the group stage, allowing them to face South Korea in the semifinals. They kept up the strong momentum and swept the semifinals match 3-0. This came to a halt, however, at the finals against the Thailand team, whose aggressive style resulted in them winning three straight games against Taiwan. You can find more detailed results of the boot camp matches in our AWC 2018 Boot Camp Overview. Joining the last spots for each group (Tier 3) are MSP, Indonesia, Europe, and South America who fall under Groups A, B, C, and D respectively. The final group stage seedings for AWC are pictured below. The teams were treated to local Thai activities during their time at the camp. Renowned Thai Star Nadech was invited as a special guest to the delight of players and fans alike. Nadech even dressed as Arthur to meet the audience during the showmatch held at the Siam Paragon. The AWC 2018 kicks off on July 18 in Los Angeles, USA. The first 3 days of the tournament will follow a Best-of-3 (Bo3) format, while the quarterfinals will be in a Best-of-5 (Bo5). 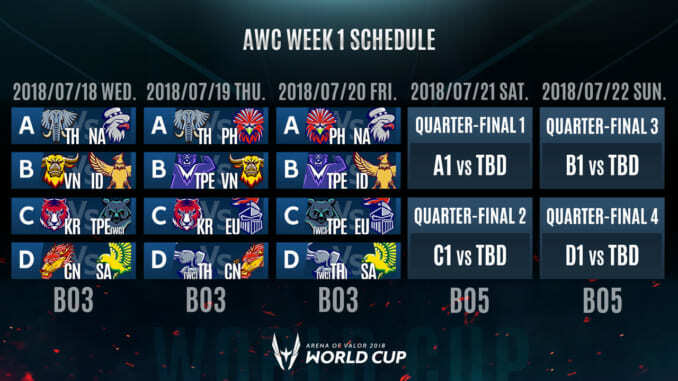 The semifinals and finals will be streamed live on July 28 and 29 on Arena of Valor’s official Facebook page, YouTube channel, and the AWC website, as well as with the in-app steaming function Valor TV. Below are the schedules for weeks 1 and 2 of AWC. A video recap summarizing the final group stage seedings was uploaded below.